When the fate of the elves rests on the shoulders of an antisocial swamp witch, will a common enemy be enough to bring two disparate races together? The Empire rules with an iron fist. The Valeroot elves have barely managed to survive, but at least they’re not Arthali witches like Elmerah. Her people were exiled long ago. Just a child at the time, her only choice was to flee her homeland, or remain among those who’d betrayed their own kind. She was resigned to living out her solitary life in a swamp until pirates kidnap her and throw her in with their other captives, young women destined to be sold into slavery. With the help of an elven priestess, Elmerah teaches the pirates what happens to men who cross Arthali witches, but she’s too late to avoid docking near the Capital. While her only goal is to run far from the political intrigue taking place within, she finds herself pulled mercilessly into a plot to overthrow the Empire, and to save the elven races from meeting a bloody end. 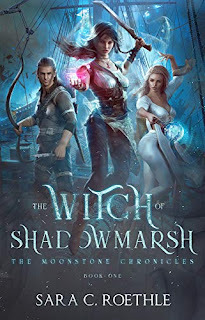 Elmerah will learn of a dark magical threat, and will have to face the thing she fears most: the duplicitous older sister she left behind, far from their home in Shadowmarsh.